The homepage layout has been changed by rearranging some elements. Font color has been tweaked throughout the site for improved readability. The menu bar has been improved with new hover animation and green highlights. All menu buttons now cast a discrete drop-shadow. This not only looks good but also improves readability and makes the menu text pop up. 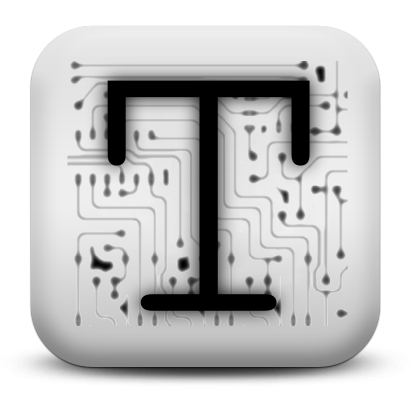 There's a new Technophile logo on the eponymous blog. 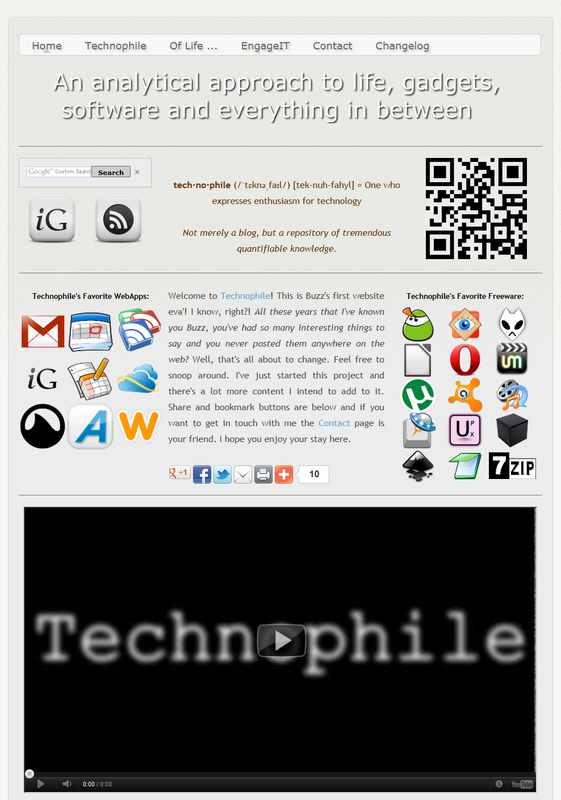 Upcoming: I've been porting the Technophile theme to a micro-blogging service which will be announced soon. The RSS Feed button on the Home Page now uses Google Reader, instead of ChimpFeedr to bundle all 3 blog feeds. The choice has been made because Google Reader is more reliable and groups the 3 feeds in a folder entitled "Technophile" so users don't need to sort them. Several typos have been fixed across all articles (thanks to Dannyboy). I remind you again that readers are welcome to report any mistakes of any kind in my articles. Feedback is greatly appreciated. There's a new Favorite Webapps section on the Home Page, that mirrors the Favorite Freeware column. More items will be added in time. Most importantly, the most significant change is the new Search Bar available on the Home Page. It's powered by Google but unlike many other Google Custom Search fields you may have used in the past on other websites this has been tweaked to have an appearance as native as possible. It also does not open a new page when you search, but instead it shows results inline. Later i might include a search field on every blog. The typeface used for the "T" is Courier New as that is deemed the official Technophile font. I'll be using the first one for high-resolution purposes and the second one for smaller buttons since the PCB-like background in the first one doesn't scale down very well. It may not seem like much but I'm pleased with it so far, especially considering i'm a newbie to GIMP and Inkscape. In other news you might have noticed a few buttons popping up all over the site this weekend. 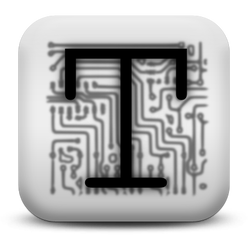 That's because I've been working hard on beautifying Technophile and improving sharing capabilities as well as integration with various services. The RSS link has been replaced with a neat looking button. There's also an iGoogle Widget for every blog as well as a mixed one for all 3 blogs available on the Home Page. 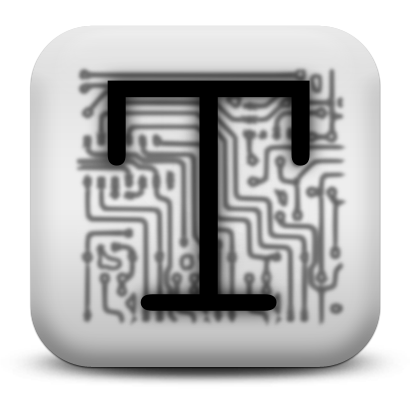 You won't find the iGoogle Gadgets in the iGoogle Directory but you can safely add them from Technophile. The iGoogle gadgets show RSS feeds from the coresponding blog.The aggregated RSS feed is brought to you by Chimpfeedr. 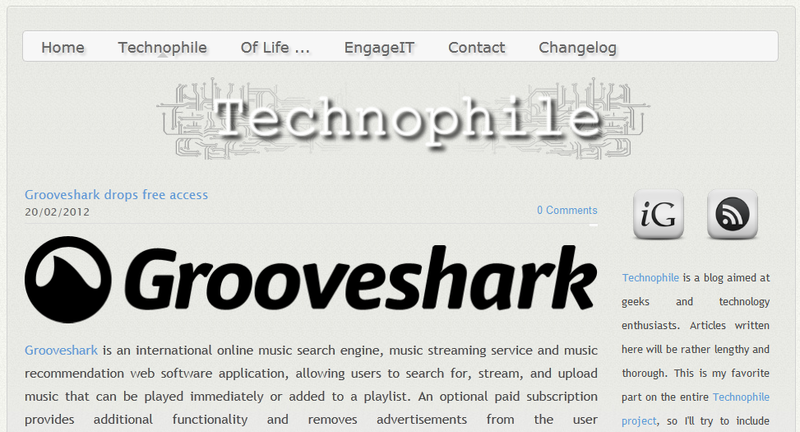 Changelog page is now visible in Technophile. This decision has been made in order to make my audience more aware of the changes I bring to Technophile even when I'm not posting new articles. While Weebly provides me with a basic WYSIWYG editor a lot of work has gone into improving and adding functionality. You will now be able to see progress made to the website be visiting this page. You may provide relevant feedback in the comments below or using the Contact Page. Flash content will be kept to a minimum, or if possible, none at all. No other plugins will be used (Silverlight, DivX, Shockwave).